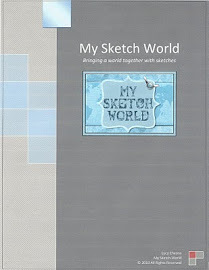 as the Tutorial Designer at My Sketch World. that will interest you and prompt you to try it. Today is RUBON as a RESIST. fabulous bird and the sentiment. Now I sprayed it with Tattered Angels Glimmer Mist. on top of the rubon. Notice how the bright white is popping off the paper. I matted this circle and this is an accent and title to my layout page. love the look of the rubon resist accent as part of the page. It was perfect touch and was a great part of using the circular part of the sketch. Here is a close up the finished accents piece with all the trims on it. Now below I thought I'd share the 2nd Rubon Resist that I tried. This one I am using on a card. I used the frame and bird rubon to start with. On this one I sprayed with 3 colours and very heavy in one spot. off the excess ink that is on the rubon. The white part is especially popping again. This is the piece when the daubing was complete. The frame and bird definitely are defined again. Here is my finished card using the same process. technique to use with so many of those rubons we all have. I used cardstock pieces and applied the finished accent to my projects. would have to have an idea exactly where to place it first. My method just allowed a bit more easy of placement. and share your project with us using this method. Love the technique Bev and your card and layout are beautiful! beautiful layout and card. definitely going to try this. Ooo, I can't stand rubons - BUT you make me wanna play with the ones I have in my stash - super tutorial and beautiful projects!! Bev, Love the lo and the card!
. . . and the tutorial - what a clever idea! Wonderful tutorial, Bev! Your layout and card are both beautiful! 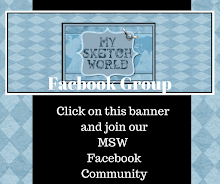 thanks ladies.. now experiment and share your projects with us in the forum.. can't wait to see what you create?